You can define layout styles that can be assigned to elements in the current application via the Styles tab in the properties dialog. Before you can do this, custom controls must have been created in the Controls area via the Edit menu. Afterwards, the style properties of this custom control can be edited in the Element settings area. More, general information about this area can be found here. This area contains a list of application controls as a tree. If you would like to create custom styles for elements in your application, create a new control in the corresponding tree branch via the Edit menu. Click here for more information about this area. The middle of the dialog is the Preview area where the styles will be shown as they will be in the browser, if a custom control is selected in the Controls area. Displays the properties of the custom control, if it is selected in the Controls area. More information about this area can be found here. 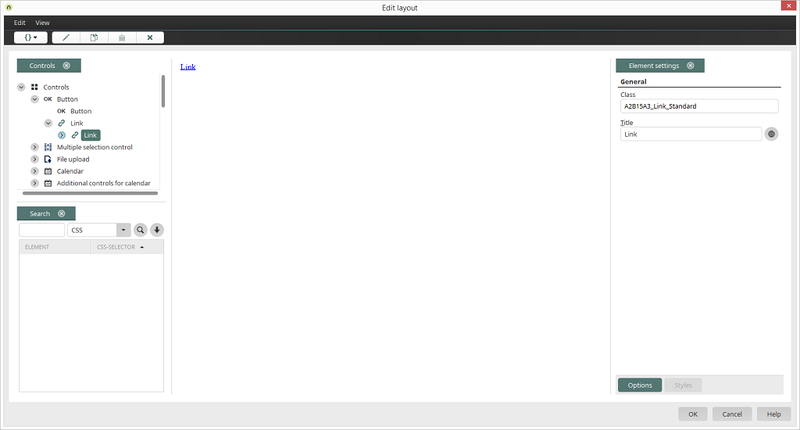 Opens an editor where the control styles and custom styles can be edited in CSS. More information can be found here. Opens a dialog where the colors currently in use in the application's layout can be replaced with different colors. Opens a dialog where the class and title of the new control can be edited. The styles of the superordinate control, which you selected in the Controls area before creating the control, are automatically applied to the new control. The same as "Add control element", but styles will not be applied. When you create new controls, make sure to use titles that are unique portal-wide. The title may not appear in a different application of the current portal. Opens a dialog with the class and title of the current control.